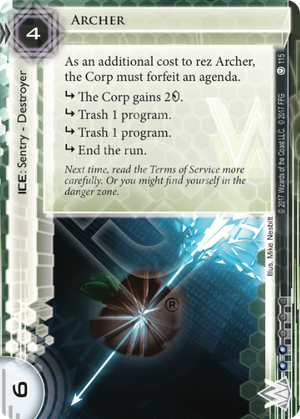 Possibly the most devastating piece of ICE in Weyland, it is a sentry that all fear when facing the corp. It is extremely taxing to run through - while maybe the runner doesn’t break that 2credit subroutine, it can still cost a pretty penny to get through for most breakers. Despite the forfeit additional cost to rez, it is rather cheap, making it easy to force a runner into it. Not only does it keep them out then, but it also can really set the runner’s rig back, opening up huge scoring windows. Against some runners that play dangerously with only one copy of a breaker and little to no recursion it can completely shut them out. Don’t let the cost of the agenda put a bad side on this card. First, Weyland has a Two for One in faction in Hostile Takeover. This is a staple part of a lot of Weyland’s economy, especially those Weyland decks which care less about keeping the runner out and more about just slowing them down to set up for the Flatline. Hostile is a perfect target for Archer - indeed, while it can be very possible to sack a two or even three pointer to Archer, rarely the tempo gained is worth the loss of points for anything beyond a single pointer. With that agenda in faction and very easy to get on the table to power up Archer, this sentry becomes a devastating weapon to use against a runner who face checks without a killer - or two broke to use the one they have installed. Archer remains a constant threat and will remain a strong piece of ICE.